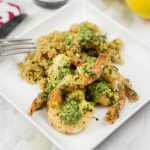 Lemon Garlic Shrimp – Super quick and easy dinner of shrimp sauteed in butter and garlic and then finished with lemon juice. 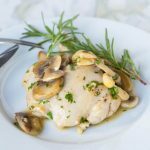 Life is busy all year round, so if you are anything like me, you are always on the look out for quick and easy dinner ideas. One of my favorite things to use to get dinner on the table fast is shrimp. Shrimp recipes cook in no time, so dinner is always ready quickly. 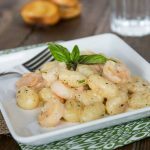 And this garlic shrimp is done in 15 minutes, you can’t beat that! And if you can make it in one pan that is even better! 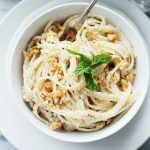 Shrimp Fettuccine Alfredo is definitely a favorite, and I love how fast is on the table. Shrimp dinner recipes are usually like that. 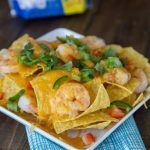 Shrimp cooks in just minutes, so there is no waiting, not a lot of prep and you can have dinner together as a family more often. Now that spring is actually in the near future, we can start talking about some more spring like food. Like this lemon garlic shrimp. Lemon in anything just brightens it up, and makes it spring like in my mind. 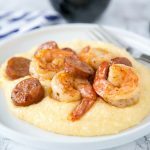 Lemon Shrimp & Grits is a fun and light twist on a classic. 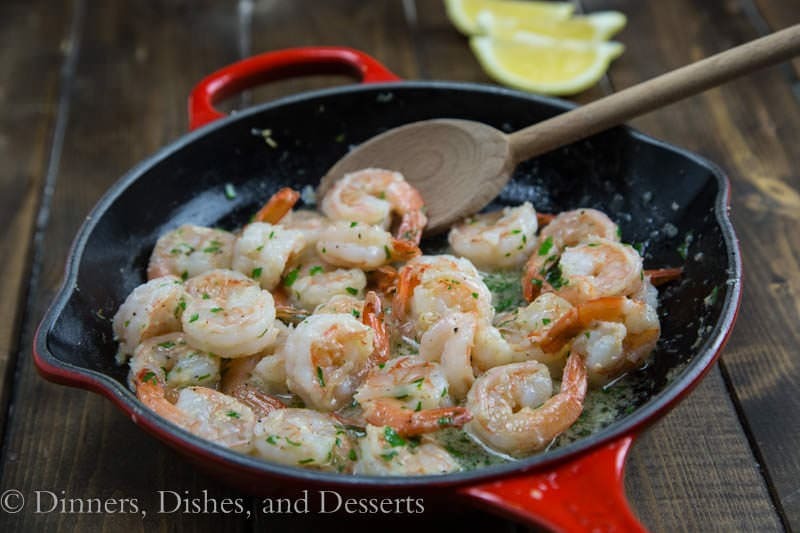 I love having shrimp recipes for weeknight meals. Sauteed shrimp cooks in just a few minutes, and goes with pretty much anything. As my husband says, shrimp is kind of like chicken in the seafood world. You can dress it up with any flavors you want, and it just works. You want it spicy? Spicy Garlic Shrimp is a favorite and ready in about 15 minutes! Shrimp in garlic butter is pretty much as classic as you can get. But adding lemon just gives it that little twist to make it something new. You can serve this over pasta, or with a salad or other vegetables. My family would eat shrimp pretty much every night, if I let them. So this was definitely a hit at our house. 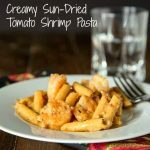 Shrimp Dinner Recipes are pretty much my go to on busy nights. Personally, I loved that it was ready in 10 minutes, so I didn’t have to spend all night in the kitchen. And it is made in one pan, so the dishes were not a problem either. This sauteed shrimp is so full of flavor you will love it. 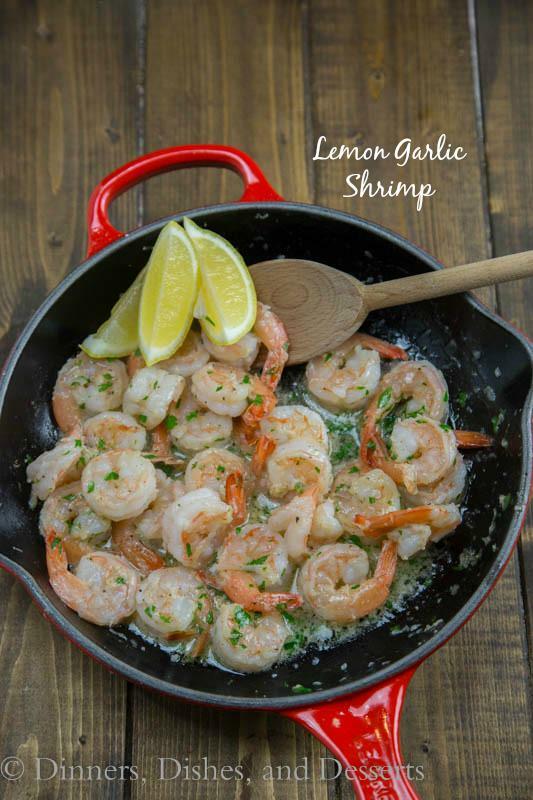 Lemon garlic shrimp will definitely be on regular rotation at our house, how about yours? 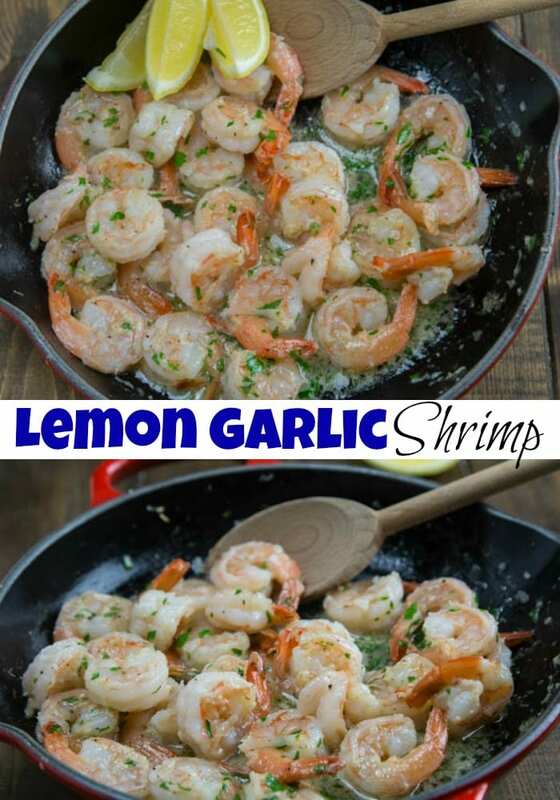 Lemon Garlic Shrimp - Super quick and easy dinner of shrimp sauteed in butter and garlic and then finished with lemon juice. In a large skillet heat butter over medium high heat. Add shrimp and garlic to the butter. Saute for 3-4 minutes per side, until cooked through. Season with salt and pepper. Squeeze the juice of 1 lemon over the shrimp. Stir to combine. Garish with fresh parsley if desired. If you need even more Dinner inspiration browse through my Recipe Index. There you can find even more Shrimp recipes. Also follow along on Pinterest for even more great ideas. Healthy and delicious! Sounds like a really great sea food dish! A classic with a twist of something new. It sounds delicious. And healthy. Lemons brings something good in recipes. I haven’t had a shrimp meal in ages. Thanks for the inspiration. Other than that, it sounds like a great recipe! Can’t wait to try it! HA! Thanks for pointing that out, fixed now! The flavors of this are amazing! A great weeknight dinner. 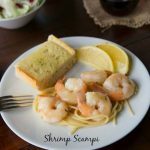 My kids love shrimp and with the addition of lemon and garlic they would devour it. Such a simple and tasty dinner! can’t wait to try! Quick and simple is what I’m always looking for!! I love shrimp pasta so much! I love how easy and delicious this is! 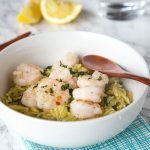 Perfect dinner idea for busy weeknights! I love shrimp. I cannot wait to try out this recipe! I agree that shrimp makes for a terrific weeknight meal. Lemon and garlic are the best! 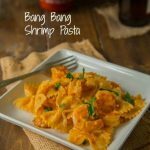 We love shrimp in our house and this is a perfect easy, light meal! Looking forward to making this after vacation. I love shrimp! It’s so easy to just fry up a pan! This looks delicious! Such a summer dish.! Shrimps and lemons are so perfect together! 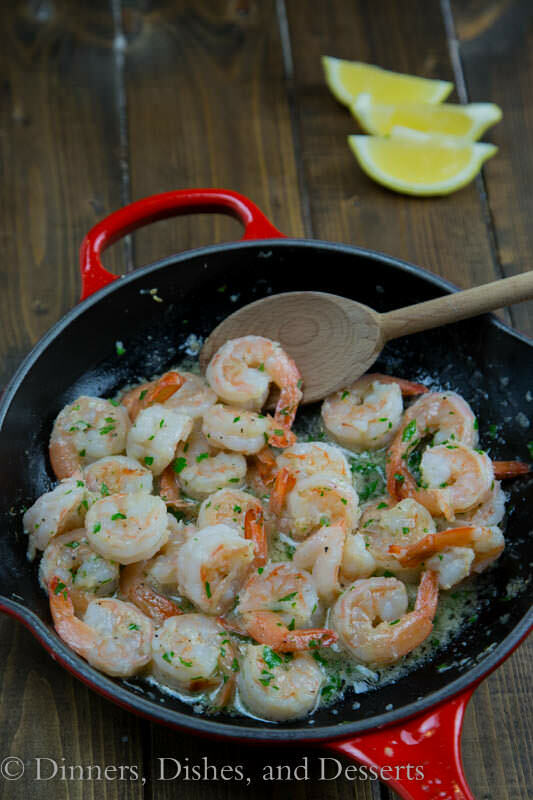 Nothing better than quick shrimp with plenty of garlic! 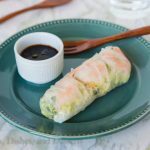 This looks super delicious and easy to make!